[249 Pages Report] The overall market of blood culture test is projected to reach $4,768.9 million by 2021 from $3, 252.6 million in 2016, at a CAGR of 8.0% during the forecast period. The base year considered for the study is 2015 and the forecast for the market size is provided for the period between 2016 and 2021. This report aims to estimate the market size of blood culture test and future growth potential of the global market across different segments such as method, product, technology, application, end user, and region. Factors such as rising aging population, increase in product approvals and launches, growing number of sepsis cases, high incidence of bloodstream infections (BSI), increase in demand for rapid diagnostic techniques, and high prevalence of infectious diseases are driving the market growth. On the other hand, factors such as high cost of automated instruments and lack of technically skilled professionals may hinder the growth of this market. This study estimates the market size of blood culture test for 2016 and projects its demand till 2021. Top-down and bottom-up approaches were used to estimate and validate the sizes of the global market and various other dependent submarkets of the market. The key players in the market were identified through secondary research, and their market contributions in the respective regions determined through primary and secondary research. This entire procedure includes the study of the annual and financial reports of top market players and extensive interviews for key insights from industry leaders such as CEOs, VPs, directors, and marketing executives. All percentage shares, splits, and breakdowns were determined by secondary sources and verified through primary sources. All possible parameters affecting the markets covered in this research study have been accounted for, viewed in extensive detail, verified through primary research, and analyzed to reach the final quantitative and qualitative data. This data is consolidated and added with detailed inputs and analyses from MarketsandMarkets and presented in this report. This report covers the global market by method, product, technology, application, end user, and region. *Other laboratories comprise pathology laboratories, bacteriological laboratories, physician office laboratories (POLs), and independent research laboratories. 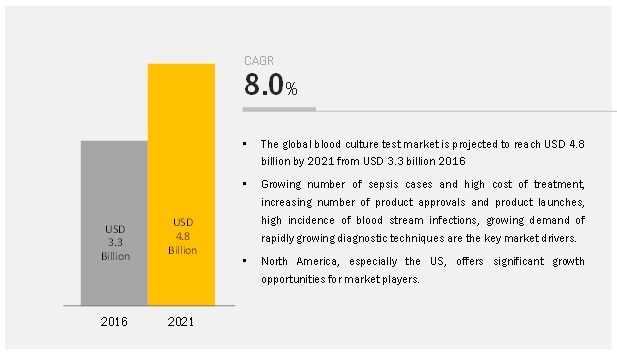 Growth of the market can be attributed to increasing number of sepsis cases and high cost of treatment, rising geriatric population, growing number of product approvals, high incidence of bloodstream infections, growth in demand for rapid diagnostic techniques, and high prevalence of infectious diseases are driving the market growth of blood culture test. On the other hand, factors such as high cost of automated instruments and lack of skilled laboratory technicians are limiting the market growth of blood culture test. High incidence of blood stream infections are expected to drive the market growth to a certain extent during the forecast period. Based on method, the market for blood culture test is broadly segmented into conventional/manual blood culture methods and automated blood culture methods. The automated blood culture methods segment is expected to grow at the highest CAGR in the forecast period. The high growth of this market is attributed to the quick turnaround time, reduced risk of contamination, and low manual intervention required in automated blood culture. On the basis of product, the market for blood culture test is segmented into consumables, instruments, and software & services. In 2016, the consumables segment is estimated to account for the largest share of the blood culture test market. The repeated purchase of consumables as compared to instruments is the major factor expected to drive the growth of this segment. Based on technology, the market for blood culture test is segmented into culture-based technologies, molecular technologies, and proteomic technologies. Amongst these, molecular technologies are expected to grow at the highest CAGR during the forecast period. The growth of this market segment is attributed to the increasing incidence of sepsis, which demands rapid diagnostic techniques for detecting the presence of bacteria, fungi, and mycobacteria from blood samples. Based on type, molecular technologies are categorized into PCR (polymerase chain reaction), PNA-FISH (peptide nucleic acid - fluorescent in situ hybridization), and microarray technologies. Among these, PCR is expected to grow at the highest CAGR owing to its quick turnaround time and the increasing demand for rapid diagnostic techniques. Based on application, the market for blood culture test is segmented into bacteremia, fungemia, and mycobacteria. Among these, bacteremia is estimated to account for the largest share of the blood culture test market in 2016 and grow at the highest CAGR during the forecast period (2016-2021). The high growth rate and large share of this segment is primarily attributed to the increasing number of bloodstream infections and growing number of sepsis cases on a global level. On the basis of end users, the market for blood culture test is segmented into hospital laboratories, reference laboratories, academic research laboratories, and other laboratories (pathology laboratories, bacteriological laboratories, physician office laboratories (POLs), and independent research laboratories). The reference laboratories segment is expected to grow at the highest CAGR during the forecast period. The increasing outsourcing of blood culture tests by hospitals to reference laboratories, as they are equipped with advanced diagnostic techniques that provide blood culture test with a quick turnaround time, is the primary growth driver for this market segment. The global blood culture test market is dominated by North America, followed by Europe. However, the market in Asia is expected to register the highest growth rate in the forecast period. Factors such as high incidence of sepsis and government initiatives to increase awareness on the disease, increasing demand for effective diagnostic techniques, rising awareness about early disease diagnosis, increasing adoption of advanced technologies, rapid rise in geriatric population, and growing regulatory approvals & availability of blood culture test products in this region are contributing to the high growth rate of this market segment. 13.4 Thermo Fisher Scientific, Inc.
Table 1 Five Most Expensive Hospital-Treated Conditions in the U.S.